Michael should be overjoyed by the birth of his son, but his wife, Sarah, won't let him touch the baby or allow anyone to visit. Greta, an intrusive, sinister doula has wormed her way into their lives, driving a wedge between Michael and his family. 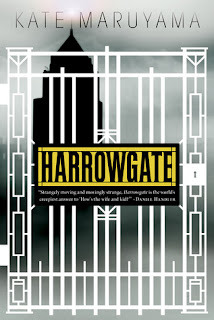 Every time he leaves the Harrowgate, he returns to find his beloved wife and baby altered. He feels his family slipping away, and as a malevolent force begins to creep in, Michael does what any new father would do... he fights to keep his family together. 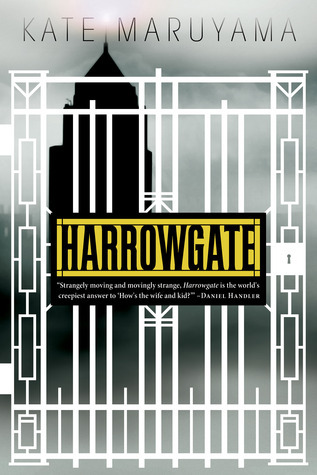 Kate Maruyama's debut novel, Harrowgate, is a chilling, richly detailed story of love, loss, and the haunted place that lies between. Michael often travels for work. He gets a message that his wife, Sarah, has gone into labor while he is out of town. He immediately packs and goes home as quickly as possible. He finally reaches the Harrowgate, his apartment complex, and Sarah is there... with his newborn, Tim. In the very beginning, Sarah acted weird... paranoid. Sarah wouldn't even let Michael hold Tim at first. Then Sarah wouldn't allow anyone in the apartment or let Michael leave. Every time he would leave, when he came back, Sarah and Tim were older, different. Then here comes Greta... the sinister/hippie/loving mother looking type. Michael immediately dislikes her (as do I), but Sarah is enamored with her. Greta even gives Sarah a special tea to drink that makes Sarah feel a little better, but then Greta gives some to Sarah to secretly give to Michael. What's up with that?! Greta always says, "Everything I do and help you with is so that you can be with your baby and Michael." It's awfully rhetorical... Michael and the baby, Michael and the baby... I was to the point of thinking bad thoughts about Greta by the middle of this book. As the story progresses, Sarah's physical condition worsens, Tim just keeps growing, and Michael realizes there is evil in his home. Something that he has to fight. He wants to keep his beautiful family and NOTHING will change that. It was particularly hard to review this book without unintentionally including spoilers. Its one of those books like The Exorcist... you want to experience every moment as if it was the first time you're reading it. I recommend this book to anyone who likes creepy mystery/thrillers. I'd have a giveaway for my copy, but my goober wiener dog knocked a glass of water on it so... go buy it for your nook or kindle. I just finished reading an ARC e-book called The Art of Good Habits and really liked it. I simply cannot go past a book when the review begins with a profanity. Thanks for sharing, this looks freaking awesome.